Is Time it Invest in Company Culture at Your Organization? Is Time it Invest in Culture? Improving work culture has been a hot button item for decades now. Now more than ever, there is an emphasis on work being “fun.” I’ve even seen offices with beer on tap. Employees get to sip the hoppiest IPAs wearing their Sunday clothes while kicking back in beanbag chairs. It’s the future, climb aboard! Jokes aside, there is a very real method to this madness: Companies that focus on employee satisfaction can actually improve their bottom lines. Forbes reports that companies with strong cultures see a 4x jump in revenue growth. And it makes sense: The more engaged someone is, the more they’re able to focus and succeed. Still, most organizations don’t try to define culture in any meaningful way. Perhaps because managing culture is difficult. It takes time, energy and investment—and a watchful eye to understand what drives the success of your business. 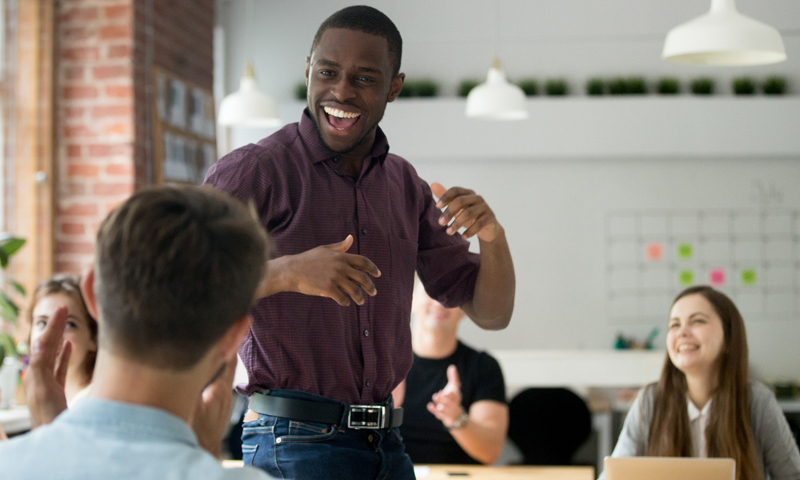 If you’re considering investing in your employees’ happiness to maximize growth, here are four things you must consider. While offering an artisan selection of your favorite local breweries may make your workplace seem hip, that won’t necessarily drive your success or build your culture. First and foremost, success is what drives a culture. People are happier when they are successful. If you want to strengthen your culture, first your company needs to define “success” and create benchmarks to reach it. Once your organization has clearly defined its goals and the benchmarks to hit them, celebrate those wins, and watch your employee engagement multiply. The more engaged people feel, the more they’ll want to see the organization succeed because you’re all doing exactly what you’ve set out to do. Unifying your culture might be as simple as actually hitting your projected numbers. Imagine the hip company with microbrews not getting anything done. There’s no way that feels good. If you’re not producing results, then what’s the point? Don’t take your employees on a field trip if they haven’t earned it. Remember that success breeds engagement. Culture is the easiest way to retain employees. When you create a team-oriented culture that climbs the ladder, your employees will stick around and keep climbing. We don’t mean to interject a shameless plug here, but at Select, we invest energy into defining our company culture. We’re all remote, which means our collaboration efforts are out of the box, and we use the technologies we suggest to our clients to unify our own workforce. As a distributed team, we use creative ways to measure and execute success. I want to share those with you. Once a week, our team comes together for a conference call. During this weekly staff meeting, we highlight each other’s achievements—recognizing the work we do for one another. A good portion of this meeting it spent purposefully lifting each other up. We don’t see each other often, but when we do, we use it to celebrate one another. No matter how pressed your organization is for time, there should always be time for this. There are countless ways to engage your team. When someone is sick, you can send soup to their residence. You can throw parties (occasionally) to focus on connection and not work. But the bottom line is: at the end of the day, work is about making a difference. The key to engagement is getting your employees to take a vital role in that difference. To learn more about effective management and leadership, check out CEO Jerry Goldman’s article, Clarifying the Difference Between Management & Leadership.